Many chemists have a dream: that one day they will be able to achieve full control of chemical reactions at atomic-level precision. The dream bears out chemistry’s long history of making and breaking chemical bonds through trial and error. But theoretical chemists at UC San Diego are beginning to see their dreams come true as they mix molecules and light in tiny black boxes, or “optical cavities.” Their promising study, titled “Remote Control of Chemistry in Optical Cavities,” was recently published in the Cell Press journal Chem. Yuen-Zhou worked with graduate student Matthew Du and postdoctoral scholar Raphael F. Ribeiro to theoretically and computationally design a novel quantum device that supports ultrafast—one millionth of a millionth of a second—tuning of chemical reactions between catalysts and reactants that are not in physical contact. In practical terms, imagine successfully mixing oil and water using soap except: (1) the soap does the job without being added to the liquids and (2) the mixing occurs in less time than a blink of an eye. This theoretical quantum engineering applied to chemical reactions, according to the researchers, is the next frontier in chemistry. By exploiting the fact that light and matter can couple strongly and lead to changes in chemical reactions, the UC San Diego scientists proposed a device where a catalyst and reactant are separated from each other across several optical wavelengths between the two cavities. They then showed that photoexciting—increasing the energy of molecules by absorption of light—the remote catalyst in one optical box changes the photochemistry of the reactant in the other box. Their theoretical work, which Yuen-Zhou refers to as pushing the envelope of the field, should apply to many other reactions, thus introducing a versatile tool to control photochemistry. “This was a team effort,” noted Ribeiro, explaining that the results have implications for making the practice of chemistry more economical and time-efficient. 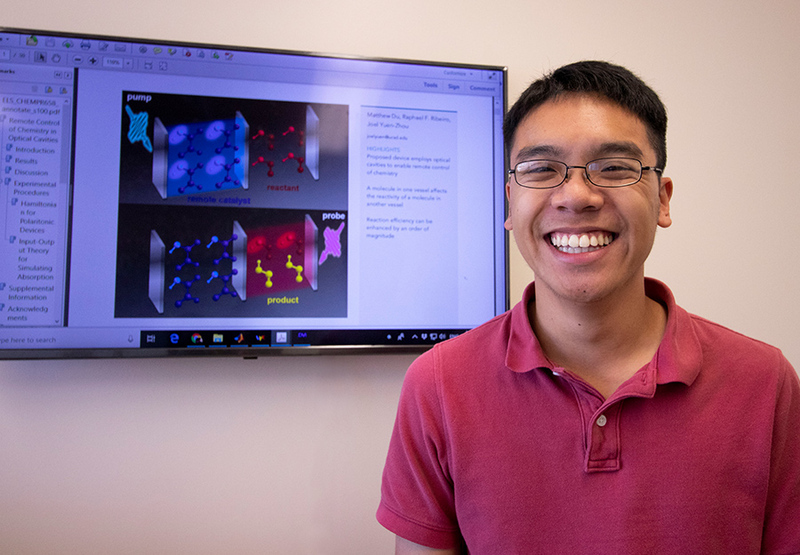 Du, first author of the research paper, said that it was rewarding to see everything—the right molecules, reactions, equations and physics involved—come together in a theory. “It was a beautiful chain of events,” he said. This research was supported by a UC San Diego CRES postdoctoral award, the AFOSR (award no. FA9550-18-1-0289) and the US Department of Energy, Office of Science Early Career Research Program (award no. DE-SC0019188). The Department of Chemistry and Biochemistry at UC San Diego is ranked among the nation’s top 20 programs according to U.S. News and World Report.